Peter Abelard and Heloise:- 12th Century, French. They married secretly, Abelard uncle (Heloise)found out & had Peter castrated. They already had a son by then, separated by families & the church, she joined a convent & he become a monk. They love letters still exists. Shah Jahan & Arjumand Bann Begum:- 17th Century, Indian. He built Taj Mahal in Arjumnad Bann Begum’s memeory. She died at the age of 39 after giving birth to their 14th Child. These love stories are still thought, enacted or told to someone across the globe. But India is extraordinary in its own way. Indian People feel the wedded bliss lies only in hallowed institution of “ARRANGE MARRIAGE”. The most appreciated theme for marriage is arranged one. They portrait the cons of arrange marriage in such a way that you feel in love marriage, you are not getting married to human but rather to a stone –which is capable of running everything that you have earned in life till date. That could be Money, peace (I don’t understand which family has peace, but still let’s consider peace for this blog), relationship, position in society, you would end up been laughed or most talked topic among your Family & friend. I feel any publicity is better be it bad or good. If the marriage is inter-religion, then Bhagavan, Allah, Jesus, Gurunanak even if all decide to run for your help, you will not be spared- u would still need help from galaxy. They still look at love-marriage-couples with raised eyebrows for their unfaithful deed. For better or worse, we get married, some go through arranged & few through love marriage, but the end result is same i.e you are screwed. I have come across many people in & around my society, who still feel love marriages are not meant for our society. They feel it’s a westernized form of getting married (Thank god my parents are not among this gang). They have such a big abhorrence for love marriage that they over look the emotional downturn their child would face. The biggest challenge for parents is acceptability in society. For this, Parents will ensure apart from your expectations, rest match the Colum is done. The horoscope are matched, family background, Goddess they worship, if there is a slight change in the traditions then which one is better, Education (according to them), Family status etc. All the above mentioned love stories are heard & transmitted to further generation. One Love story in my opinion is eternal that too in Indian Society, can’t believe correct!!!!!!. Sadly the media has not commercialized it or they would not be given the power to commercialize. According to me it’s Rajiv Gandhi & Sonia Maino. It’s not a legendary love story but a tough one…..and high on my priority list. Sonia Mino was born & brought up in the Italy, raised as Roman Catholic. She meet Rajiv Gandhi at Cambridge University. Their courtship lasted 3 years & then they decided to get married. I feel the need to get in to Rajiv Gandhi’s brain for that period, did he misunderstand his home town for some reason? Did he forget he is from India and not USA. Ha…..Think he had a temporary memory loss. He had enough reasons to decide against her rather than in her favor. So what if the courtship was for 3 years, break-ups is not a new thing to world. People break away 10 years of relationship, marriage, run away from their responsibility. He would have decided to call off the courtship, which is a normal trend across world. Youngster fall in love and suddenly one day out of the blue, they get the wisdom about ill effects of love marriage. 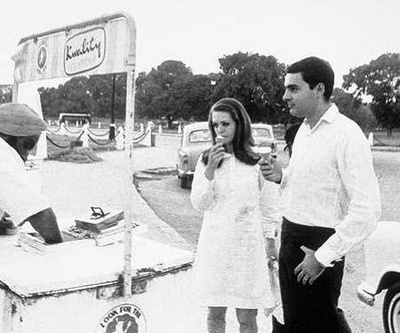 It would have been easy for Rajiv Gandhi to follow the trend……..but he did something against all odds. He married Sonia Mino. I can give my take as why we would have ended their relationship. 1) The stakes were too high. Knowing India & been from a Political background, he would have realized his act would ruin the political carrier of his mother. Indian people have a tendency to vote for anything that is traditional……or which represents their culture. 2) Incase if Indira Gandhi didn’t agree? Indian people have a habit of saying,”All celebrities are used to cross-culture, they can do anything for fame” If that was true ideally Indira Gandhi should have married her son to a village girl instead of a westernized one. That would have got her lot of vote. 3) India’s divorce rate is v less as compared to Italy. For Indians all white people belong to the same country & they have a higher divorce rate. What if after certain period, Sonia Gandhi would command a divorce? It would have spoiled Rajiv Gandhi’s political carrier. Sonia Gandhi managed all her odds very well. 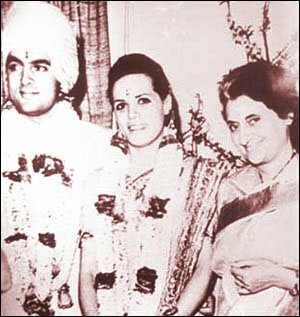 She managed to stay in the marriage, gracefully inherited the political carrier which she didn’t wanted to with 2 major heart burns (death of her mother-in-law & husband).I strongly feel Rajiv Gandhi’s huge contribution in aligning Sonia Gandhi in Indian Culture, yet maintaining her own identity. She might have not encountered a Hindu-culture in her vicinity during her up-bringing. Yet she did manage well to settle down in the culture. The way she carries herself with the 6-yard Saree is seamless. How many Indian politicians have you seen wearing a Saree so gracefully? None in my opinion…..
After assassination of Mother-in-law & Rajiv Gandhi, average women would have left this country. She lost her husband to a country which is not her’s, that too for a reason which is beyond her understanding. Because she married to a Man from different religion, left her hometown, got customized to his culture, and here her husband gets assissinated for a religion issue. What worse can India give her? But she still serves the same country , striving a better future of the country men. She represents women’s strength to forgive, except & go ahead with time. I appreciate her dedication to her caste till date & to give her children a blend of both cultures. A person’s caste cannot be changed because he/she is born with it. She has done what was accepted out of her & this can only be possible by a person who is great by her deeds. Hey Pradnya….you are amazing….no one have ever thought about this couple ever…. you not only thought about them but have made people change their perception about love marriages. I think people would now see with a different attitude the sacrifices, adjustments, committment, dedication, difficulties and loyalty in people who fall in love and get married. Keep going girl, you are incredible. Wah! Pradnya, well said. Something I am sure most of us failed to ponder about, you have brought to light. I believe integrity and character are virtues of a handful. And Rajiv Gandhi is among the minority. Many know of his political integrity. You highlighted the personal side…. Cudos! Well said dear.. i think you should make a documentary on culture and religion… then only our society will understand that there is whole lot of world of adjustment, compromise, happiness for a couple ..Rather the fighting on the issue of arrange marriage and love marriage.. Very well said. I never knew there were more love stories other than Romeo-Juliet. i think its not the fault of the people who think about caste,religion,culture….may be because being in a country with so many religion and then n numbers of caste in them……there is so much of confusion going around in thier heart(i used heart caz dey dotn think from heart on matters related to love)…caz they just speak the language of thier ancestors in such matters…but nowadays i dotnthink there is much of a problem in love marriages related to caste or religion as we and our parents are more matured……times are changing..and hope people with that thinking will also changeeee…or we have to explain ur message to them personally…….. You should pucca write a book on any of the topics yaar… would request you to write on topic related to Mumbai earlier and Mumbai now…. Very well said.. Thanks for posting this amazing article which brings more lights..
You are amaazing Yar !! This article makes me really to think how great Sonia is..
Oh is it. I didnt knew it…..anyways this was just an article about what i knew about her life. Reality is always different. Dear Deepak, I appreciate you opinion. I have come to know that she (sonia gandhi) wasnt even studying in cambridge, she was a waitress there. Its just a blog depending on the data that i got form net. So dont take it this personal. If Its just a blog depending on the data that i got form net, then please surf a bit more and know more about her. When sonia came in power we lost madhavrao scindia, Rajesh pailot. President is Manmohan. She had given wrong information about her to nation. Maino family is now Billionaire why and how..? Hi Pradnya amazing story,and it’s a real love story ,its true, marriages r made in heaven….Soniaji is really a wonderful woman with lots of sanskar within her….sanskars we get it from our parents,she had brought up from a sanskari family….She has given all Indian Sanskar to her kids,she have been staying like an Indian woman….she is a true and real child of Bharat Mata….i really feel proud of her & inspirations for Indian women…. Sonia Gandhi didn’t have anything back home that she would have dared to divorce her husband or leave country after her husband died. She was a waitress and daughter of a building mason. Please surf a bit more. why would she have left such a luxurious life? U can’t term it as true love coz had her heart been true, she would not have made billions in multiple scams that the country is facing. She didn’t even made for herself, she is gathering wealth for her son in law as well… Do u call this love or Greed?